- This location is found in the heart of Lexington, more or less right in the middle of the city. (It’s up and to the left a teensy smidge from the Lexington symbol on your map.) If you see a tricornered clearing filled with junkers, populated by Ghouls, and watched over by a Raider with a rocket launcher, you’re in the right area. - The Super Duper Mart is a location straight out of a zombie movie. There are dead Ghouls right at the entrance, which should give you a taste of what’s to come. The path splits to the right and the left; we’ll check to the left first. It’s worth it to note that there are corpses everywhere, and some of them will rise up to attack you. If in doubt, check V.A.T.S. ; if the Ghoul registers as a target, it’s, uh, ‘alive’. Move slowly, and, if possible, use a silenced weapon so multiple Ghouls don’t charge you at once. - Cling to the left wall and head into the Mart. There’s a small office on your left with a Novice hackable terminal. The terminal allows you to unlock a safe - it’s right behind the terminal, and contains a bunch of ammo - as well as activate the Protectron sentry near the entrance. The Protectron is really noisy, and you can let it draw out Feral Ghouls for you while it’s active. It’s incredibly good at killing Ghouls, as well, so draw them to the Protectron to save on ammo. Follow it around the main room until you’re clear of Feral Ghouls. Check the rear of the store for a Tales of a Junkyard Vendor magazine while you're wandering about; it's on a magazine rack. 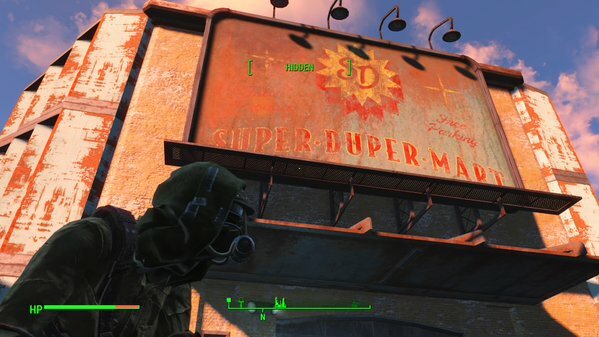 The Super Duper Mart in Fallout 4. Have fun exploring this place on your own! 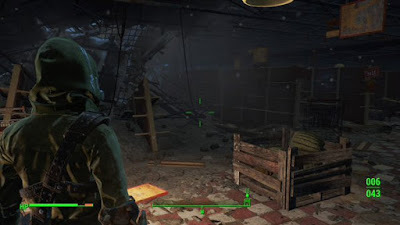 - Along the right wall is an open store room - check the shelves for an active Feral Ghoul, laying on the ground - and in here some back hallways to more rooms. Ghouls seem to spawn and look for you when you go back here, so be ready to use either the service window or the door to shoot them down. - In this hallway you’ll find a locked Novice crate on your left (hey, a Teddy Bear! ), and ahead are a number of Ghouls playing possum. Fighting them will likely trigger a decent-sized firefight; if you want to avoid being flanked, get into one of the smaller side rooms and hold your ground. (Or hide. Whatever.) If you want an easier time, though, just throw a Molotov or something fiery at the ground in this room. The ground is coated in gasoline. Foom! - In the rear of this room you’ll find the corpse of a man named Josh, and on him, among a variety of decent items, is Josh’s Holotape. It’s a bit haunting. The trunk he’s laying against has more ammo, as well, and there are several valuable Fusion Cells on the desk beside the trunk. - Head back out to the main room. (Be careful on your way out. Ghouls will likely spawn and / or become active. Hopefully Protectron can help.) There’s a Novice locked door right beside this one. Pop inside and you’ll find more hallways. There’s a room ahead that’s blue-lit; inside are multiple Ghouls. Duck into the adjacent, orange-lit room and use it to snipe the Ghouls as they come into view. The blue-lit room is a small kitchen, and in the rear of it you’ll find a bathroom. Kill the Ghoul that appears as you enter - be ready with V.A.T.S., this sucker is fast - then check the room for some Jet in a box. - … though, naturally, the small loading dock you find has two more Feral Ghouls that will become active when you enter. Take ‘em down while they’re still rising. In this area you’ll find the corpse of a man who, along with a bunch of items (and more in the boxes he’s leaning on), is carrying Emma’s Holotape. Give it a listen for more creepy storytelling. (The damned corpse got stuck to me when I picked this up. Good luck to your heart if that happens!) Use the terminal on the wall to open the doors and escape the Super Duper Mart.